MSI was predominantly known for its outstanding motherboards and gaming laptops. But now it has extended its reach to gaming motherboards, notebooks, accessories, and all-in-ones. 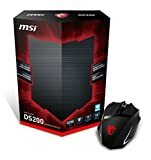 This review is about its gaming accessory MSI Gaming Mouse (Interceptor D200), which is an RGB lighting mouse that has taken over the gaming market by storm, it performs similarly to the Diamondback and Ouroboros. The gaming mouse has a subtle ergonomic design which maximizes wrist comfort during long hours of gameplay. Also, its body is coated with a non-slip rubberized plastic material. It has nine programmable buttons which are left and right clicks, DPI up and down buttons, scroll wheel, and four additional macro buttons. The left side of the mouse is molded for a thumb rest and possesses three buttons at the upper side, which glows red. The right side is designed to have a finger rest. Moreover, there is an accent strip at the left and right side of the mouse which also glows when the mouse is functioning. The top-most portion of the mouse has a rubber grip and scroll wheel situated at the front-center of the mouse. Other than that, it contains left and right click buttons, the left one contains a macro button at the front, and between them, there are two small DPI up and down buttons, which can be programmed according to the commands of the user. At the rear front where the user can have a palm rest, there is the MSI logo and at the front, there are two more accent strips which lights up when you switch on the mouse. When you flip over the mouse, you will find a factory reset button, 8200 DPI laser, adjustable weight system chamber, and two mouse feet. You can re-program all the buttons with basic and advanced windows, and the media feature will help you work more conveniently and without any trouble. You can set up a combination of macro keys from your keyboard. You can also configure your DPI volume individually for various profiles. The RGB backlighting is fully adjustable too. You can choose from 16 million RGB colors to adjust the backlight. You can easily save the settings into various profiles which include backlight settings, configuration button, and DPI settings. With extra programmable buttons, users can map their own preferable and most used features on the macros. It provides them with faster accessibility while playing. Plus, users can save up to 5 different profiles and can switch quickly via the profile switch button situated at the bottom of the mouse. It is lightweight, which allows users to move it smoothly without putting any stress or force. The beautifully molded thumb and finger rest allow the hand to move for a long time without getting tired. Also, the RGB illumination makes it easier to locate the buttons while playing, allowing more action and less lag. The MSI gaming mouse is one of a kind. With a better grip, light weight, RGB illumination, and nine programmable keys, it permits the user to have all the attributes of an excellent gaming mouse in a stylish manner.